Black River Farms: Established in 2009, this family owned and operated business features a sustainable estate vineyard with over 9 acres of grape vines and 16 high quality wines! Guests will be invited to brief tour, premium tasting with assorted cheeses, and are welcome to keep the glass! Blue Mountain Vineyards: A long-established vineyard and winery secured in the hills of New Tripoli, Blue Mountain offers a full spectrum of wine with some unique snacks! Clover Hill Vineyards & Winery: This impressive family owned winery boasts one of the most beautiful tasting rooms in the area. Group tastings are provided in the VIP lounge and paired with delicious local cheeses. Folino Estate: This new and impressive property, located in Kutztown, boasts a top-notch wedding venue, full restaurant and bar, and state-of-the art winery. Our tour-goers are offered a fantastic stuctured chocolate/dessert pairing while enjoying the views of their lovely vineyard! Vynecrest Winery: This beautiful family-owned winery is housed in a 19th century Swiss bank barn. Experience a unique & tasty pairing of locally made sweets, cheese, and crackers during your private tasting in Vynecrest's Cellar Experience. Weathered Vineyards: This family owned and operated Lehigh Valley gem is nestled among the rolling hills of New Tripoli. Enjoy 7 samples while touring the production area, as well as a fun pairing or two! The Bowers Hotel: This historic property dates back to the early 1800’s and offers old world charm and great food right next to a spur of the Reading Railroad! Folino Estate: Our groups start off with a house salad and have a generous prix-fixe menu to choose from which includes a personal pizza from the wood-fired oven. Mangia! Numerous pick up and drop off locations in the Allentown, Kutztown, and Bethlehem areas. 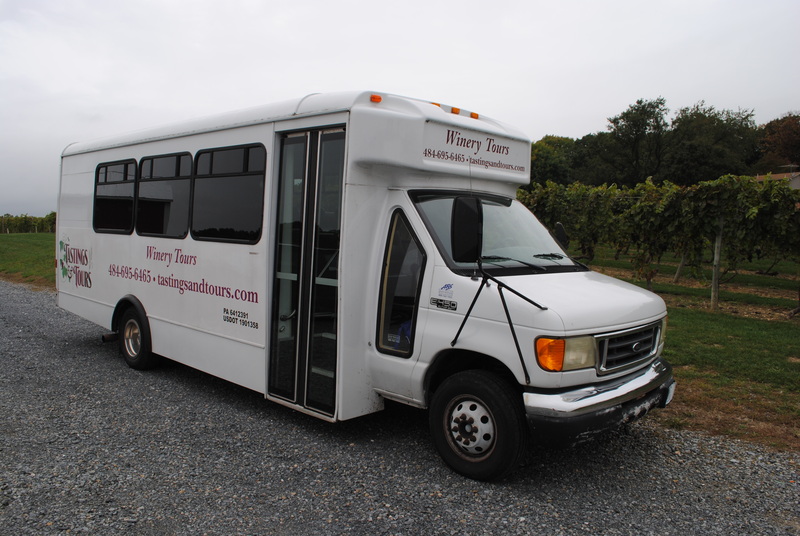 Customized/private tours are available for groups of 14.